Planting deer resistant plants and bulbs will help protect your landscaping. After spending a lot of time, effort and money planting bulbs in the fall, you dream of "tiptoeing through the Tulips" in the Spring. In late winter and early spring, however, deer are now starving and does are trying to rear their young. They are in constant search of green plants. How convenient it is for them to just walk through the yard and eat to their heart’s content? How crushed you feel when you stand where your plants and bulbs were planted and they are completely gone! A few tips and points to remember are that along with deer resistant plants, there are physical barriers such as deer fencing or deer netting, the various types of liquid fence products which are smell or taste repellents, barking dogs, or motion detection sprinklers. Using one or a combination of these products can also help where deer pressure is great. 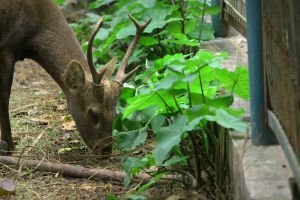 Unfortunately, no plant is absolutely safe from destruction; using plants that are naturally less palatable to deer, however, can help keep deer damage to a minimum. There are some physical attributes that you can look for when you shop for deer resistant plants- look for sharp, prickly, or fuzzy foliage or stems. Plants that have a strong fragrance are not popular with deer. Spring bulbs are available for planting that deer do not particularly like. Blooms early spring, 6-8” in height. Blooms late spring, 12-50” in height. Blooms early spring, 4-6”, good naturalizer, can be planted in the lawn. Blooms mid-late spring, 6-15” in height. Blooms early spring, 24-36” in height. Blooms late spring, 6-14” in height. Blooms mid-spring, 12-24” in height. Blooms mid-late spring, 5-8” in height.